Consolidated Construction Services is dedicated to serving our customers with excellent craftsmanship and superior customer service. Our employees are trained and certified by IICRC, The Institute of Inspection,Cleaning and Restoration Certification. CCS is a specialty construction company with a Class A general contractor license. We specialize in insurance restoration and remediation. Consolidated Construction Services is a locally owned construction company with over 20 years of experience working with our customers and their insurance companies to restore residential and commercial properties damaged due to Fire, Water, and Storm damage. 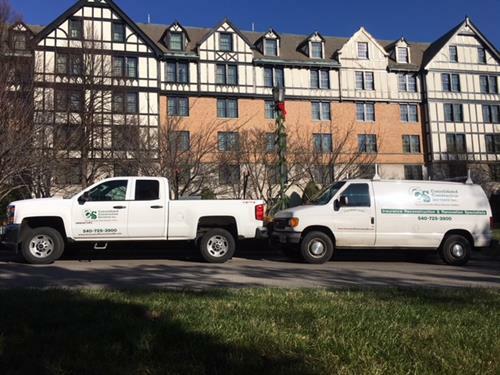 Our employees are also certified by IICRC for Mold Damage Removal. As a Restoration and Remediation company we take a damaged property through the entire process of board up,cleaning,restoring and remodel work. Consolidated Construction Services has an A plus rating with the BBB, and we are SWaM certified and ,eVA,and VASCUPP registered.We are proud to serve the Construction, Remediation and Restoration needs of the Smith Mountain Lake communities, the Roanoke Valley communities and the New River Valley communities. Get to know our company and our employees visit us on our website www.ccsroa.com, our Instagram, Twitter and Facebook Page, search Consolidated Construction Services Roanoke,VA, Our professionals serve with concern and compassion during our customers time of disaster and emergency. Always open 540.725.3900. ''Restoring Order When Disaster Strikes'', because disaster can strike at any time, we are here when you need us. New Consolidated Construction Services Vehicle. CCS water loss, water damage of a customers home. Fans placed for drying in customers home.